In his four decades at Sotheby’s, the renowned auction house, David Redden presided over many memorable sales.1 Among the most notable, he lists the estate of Jacqueline Kennedy Onassis, the Duchess of Windsor’s jewels, a lunar lander, and a copy of the Magna Carta. But the one that touched him the most was the sale of an extraordinary collection of rare Hebrew printed books, assembled by Jack Lunzer, z“l, whose first yahrtzeit will be observed in Kislev of this year. Known as the Valmadonna Trust Library, the collection consisted of over 13,000 printed books and manuscripts, and is considered the twentieth century’s greatest and finest collection of Judaica in private hands. 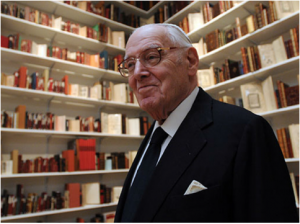 Jack Lunzer surveys the Sotheby’s display of his library with obvious delight. Lunzer, who died last year aged ninety-two, was born in Antwerp but as a young man spent much time in Italy, where his wife Ruth hailed from. He named his library after the town of Valmadonna in Tuscany, of which he and Ruth were very fond.3 He put the library into the trust for the benefit of his family. Jack and Ruth lived in London, where he built up a major business in industrial diamonds, securing monopolies in several West African countries.4 As he traveled the world on business, he began to seek out and acquire rare Hebrew books wherever they could be found. The books themselves are things of beauty. 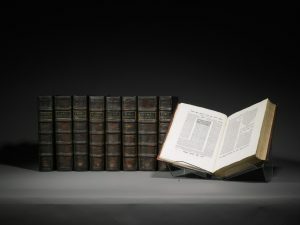 As they arrived from dealers and auction houses around the world, each volume was checked and then sent out to be elegantly rebound in rich and colorful leather. Besides the title, the spines also identify the date and place of printing, reflecting the spread of the Hebrew press around the globe in Italy, Holland, England, Greece, Eastern Europe, the Ottoman Empire, North Africa, India and China. After Ruth passed away in 1978, it was the library that kept Lunzer going. It became his passion, and filled the house. Some volumes were nestled behind wire-mesh and glass in custom-built bookcases; others were crammed three-deep in nooks and crannies. You would find shelf upon shelf of Chumashim, Mikra’ot Gedolot, the Talmud and its commentaries, and rabbinic literature, as well as machzorim, haggadot and all types of Jewish liturgy according to various rites. 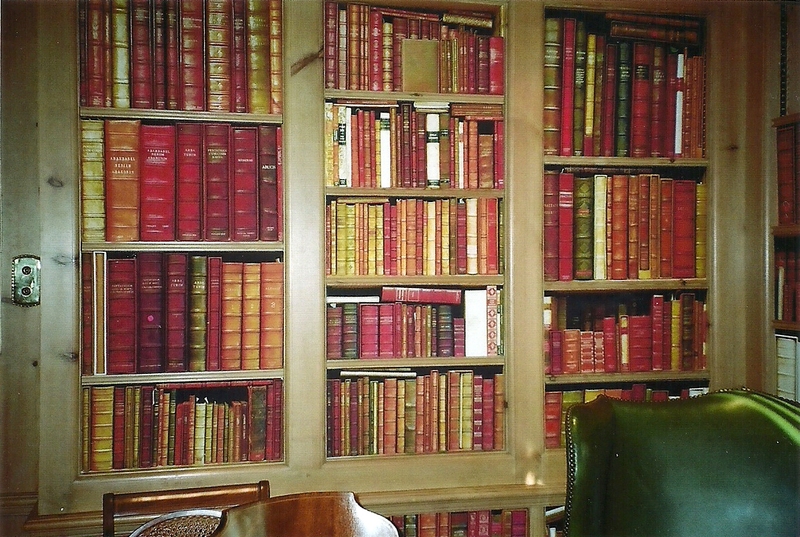 Many of these volumes were exceedingly rare, or perhaps the only extant copy of a particular printing. Lunzer enjoyed, and always wanted to share, the finer things in life. For many years, there was a minyan in his home on Friday nights in a room set aside as a synagogue. After davening, those in attendance were offered single-malt whisky served in crystal glasses on a silver tray, in order to fortify them against the vagaries of the dismal English weather on their way home. Lunzer was essentially self-taught, yet if a volume’s title page were damaged or missing, he could very often identify the printer, and sometimes even the edition, by examining the typeface. Much of his and Pauline Malkiel’s time and energy were spent on obtaining copies of missing pages from libraries that held other copies. If a book came on the market that was in superior condition to Valmadonna’s own copy, they would purchase it and send the inferior copy off to auction. Redden was unprepared for the enormous interest the exhibition would create, with thousands of visitors crowding the gallery on each of the ten days it was open (it was closed on Shabbat). “It completely and utterly amazed us,” he said. 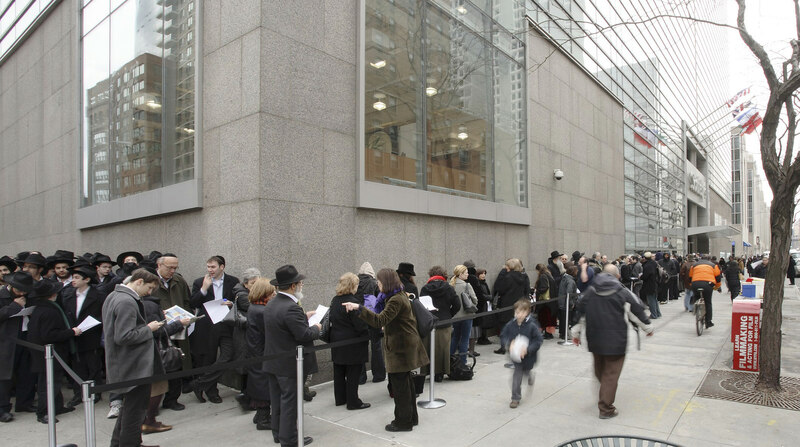 In the street outside the building, scholars lined up with Chassidim, bused-in groups of yeshivah students, and the general, mostly Jewish, public, for the privilege of viewing these treasures. 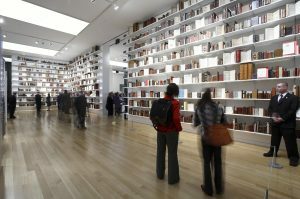 But no one purchaser could be found, as the reputed price tag of around $40 million was beyond what any institution could afford to pay. 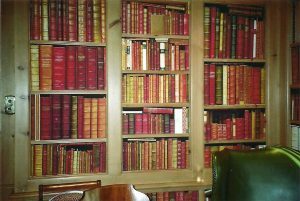 The library languished in Sotheby’s vaults for several years until Redden suggested auctioning off twelve of the most valuable items, a clever marketing move that cut the value of the remaining bulk of the library in half. Crowds lined up around the Sotheby’s building in Manhattan to see the treasures of the Valmadonna Trust Library. Some years before he died, he instructed his daughter Margaret that he didn’t want any grandiose inscriptions on his matzeivah (gravestone) except the words “Ish Sefer” (a man of the book). And that is what he was. 1. In addition to David Redden, who retired as vice chairman of Sotheby’s in 2016, I wish to thank David Wachtel, formerly senior consultant for Judaica at Sotheby’s, and Sharon Mintz, currently Sotheby’s senior consultant for Judaica, all of whom generously gave me of their time and knowledge. 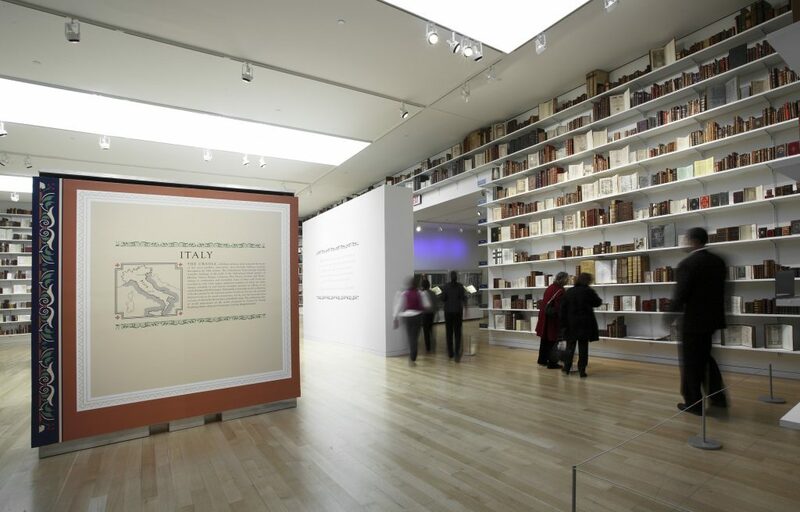 I am grateful to Sharon Mintz for providing me with Sotheby’s photographs of the Valmadonna Trust Library exhibition. I also thank the various members of the Lunzer family, as well as Pauline Malkiel, who shared with me their fascinating insights, treasured memories and photographs. 2. See Treasures of the Valmadonna Trust Library: a catalogue of 15th-century books and five centuries of deluxe Hebrew printing, David Sclar, ed., (London, 2011), available as a PDF download at academia.edu/7949515/Treasures_of_the_Valmadonna_Trust_Library_a_catalogue_of_15th-century_books_and_five_centuries_of_deluxe_Hebrew_printing. See also The Writing on the Wall: A Catalogue of Judaica Broadsides from the Valmadonna Trust Library, Sharon Liberman Mintz, Shaul Seidler-Feller, David Wachtel, eds. (2015). 3. According to some accounts, Lunzer purchased the deed to the town, thereby becoming the Count of Valmadonna. 4. He was appointed as the honorary consul of the Republic of Guinea, and sometimes received African diplomats in his home. 6. There are some scholars who believe that this is the copy of the Talmud ordered by King Henry VIII from Daniel Bomberg when he was trying to find a way to divorce Catherine of Aragon in order to be able to marry Anne Boleyn. The king had been told that Jewish law could provide him with a solution. However, by the time the Talmud arrived in England, he had already found another way out and so the Talmud was probably never even opened. 7. See youtube.com/watch?v=wog_ZuRdY64 for a charming video of Jack Lunzer relating in detail how he obtained the Westminster Talmud. 8. Redden, Wachtel, Mintz and Lunzer himself talk at length about the library in this Sotheby’s auction preview video: sothebys.com/en/news-video/videos/2011/04/Valmadonna-Trust-Library.html. 10. One of David Redden’s favorite moments was when a group of boys sang for Jack Lunzer as Lunzer fondly conducted them: youtube.com/watch?v=XKOV9jnE3sk. 11. See youtube.com/watch?v=5wNh8yqa09k for a video of the auction. 12. In November 2017, much to the dismay of Pauline Malkiel, the Kestenbaum auction house held a sale of some 200 items from the Valmadonna Trust Library, with the result that the collection will no longer be kept as one. This eventuality would no doubt also have greatly distressed Jack Lunzer himself. See timesofisrael.com/whos-selling-treasures-from-the-valmadonna-trust-library-depends-who-you-ask/. David Olivestone, former senior communications officer of the Orthodox Union, was previously on the staff of the British Library and of the Encyclopaedia Judaica. He now lives in Jerusalem. This article was featured in Jewish Action Winter 2017.